The Ming Vase dress really is a stunning work of art and design-the pattern, cut and styling are just perfection and is just gorgeous in simple blue and white hues. 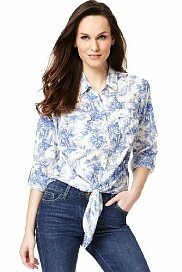 The print is of trees, horses and cottages and is really cute and quirky, definitely one I can't wait to wear this coming season. The material of this is a sheer polyester crepe and Primark also have another different china blue design in a more denser viscose material and it is a long line scarf, also £4. The print of the scarf in more detail-sorry for the creases!! What colours are you looking forward to wearing this summer, will you try the China Blue trend? Lovely scarf and unusual too. Is it a current season one - I've not seen it around. Hi Sue-yes, I bought it on Friday, they definitely have some new designs instore. That Cavalli collection is one of my all time favourites! I do love this type of print too. Love your scarf! Great scarf and so similar to the ultrs-expensive Roberto Cavalli! What a beautiful scarf! Love that print! A gorgeous Primarni bargain and I do love the China blue that's out there now. Lovely. Lovely! I saw some other examples in Primark, too - tops and flippy skirts. I love those china blue prints too. They work so well with denim for the summer. Gorgeous trend and the scarf is a beaut. 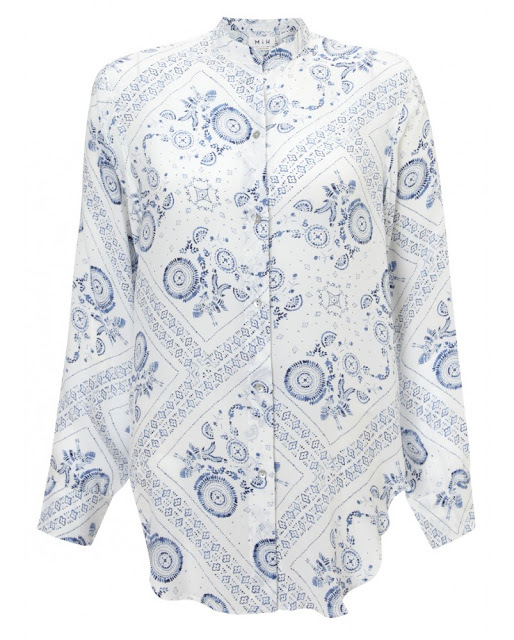 I recently bought a blue and white long blue brocade coat from the 70s on Etsy - the colours fit with what you have here and I love the crisp colour combo. Hopefully it will be warm soon so I can model it! I've been collecting blue and white china for over 20 years, so I do love looking at it! Cobalt is such a joyful color, and it is def big for spring! One color I'm going to play with more is orange- I see it on others and it looks so fresh to me. Orange will go great with "China Blue," so I might be mixing it all up too!